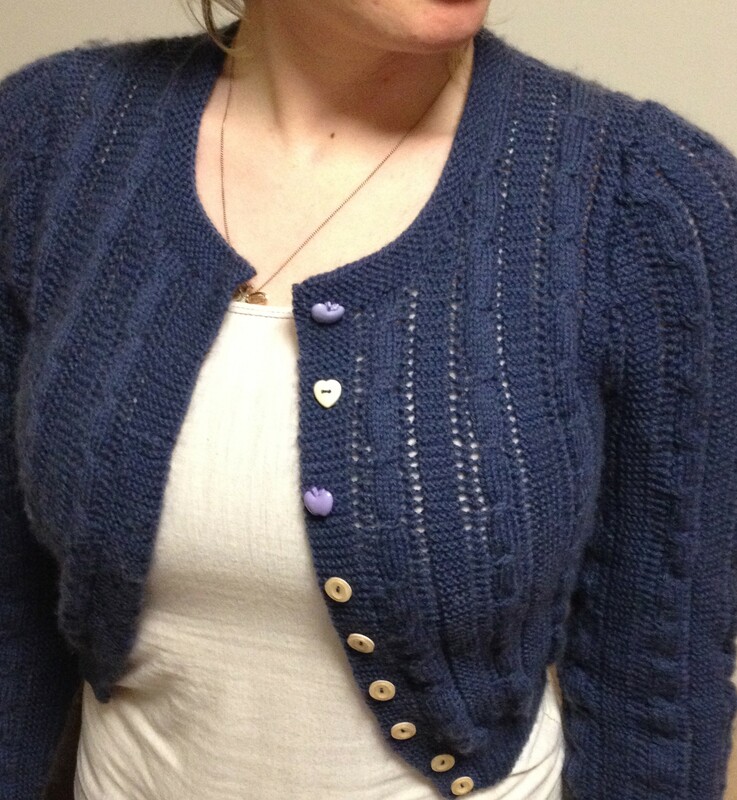 As promised, here’s photographic proof that I have finally finished that bloody gabriela! Enough pictures, let’s talk details. After finishing up the Sambuca, I tried going back to my beloved sock knitting and I just wasn’t feeling it. 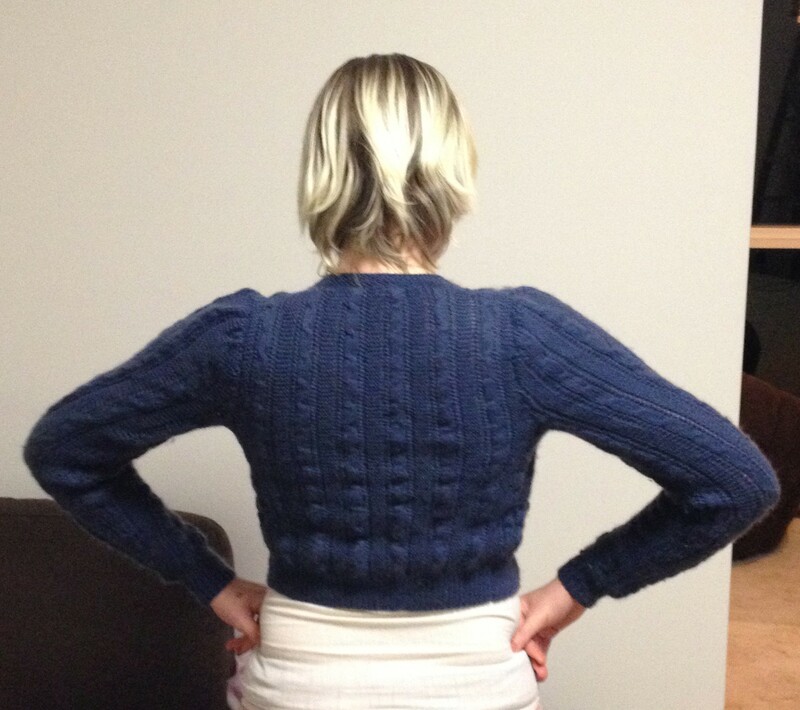 I was, however, loving how good it felt to wear a handknit jumper, even if it was a tad too short in the body. 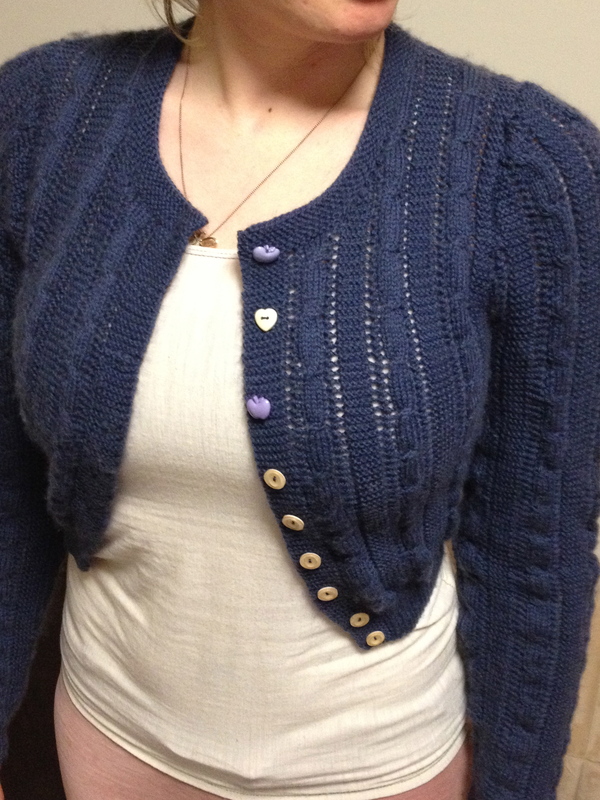 So I resolved to finish my gabriela cardigan, which had continually plagued me with doubts over how small the back and front pieces were looking and those doubts severely drained my ability to finish it last year. But I rode the success of the mighty Sambuca all through the remaining body of the gabriela and after what seemed like months of sleeve knitting I was finally at the point of joining the pieces together then knitting the neck band and sewing on buttons. As for the buttons, I didn’t have enough round yellow ones made an artistic decision to include a few special ones from my stash, so there’s two purple apples and a yellow love heart. 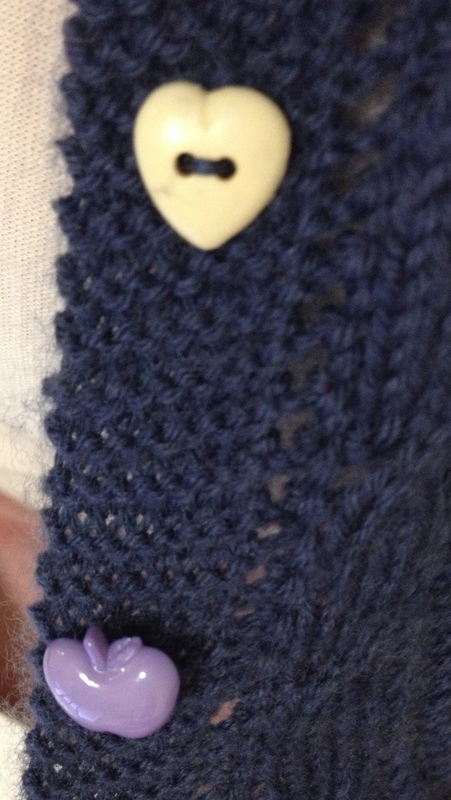 I quite like the whimsical touch, but Pete’s a bit miffed that he won’t get the heart on his next shirt sleeve. Cue vomit from cheesy romantic gestures. I’m not sure why one sleeve head looks a little gathered and the other doesn’t, or why the it bags out at the bottom back and I am a little worried I look like a quarter back with how the shoulder seams are sitting, but I still really quite like this cardigan. Surely after completing a trouble plagued cardi I would want to return to the joy of sock knitting, right? Wrong. I just wanted more and more wooly jumpers and cardigans. I was hitting “Favourite” on sweaters, jumpers and jackets on ravelry like they were going out of style and eyeing off my sweater quantities of stash yarn. 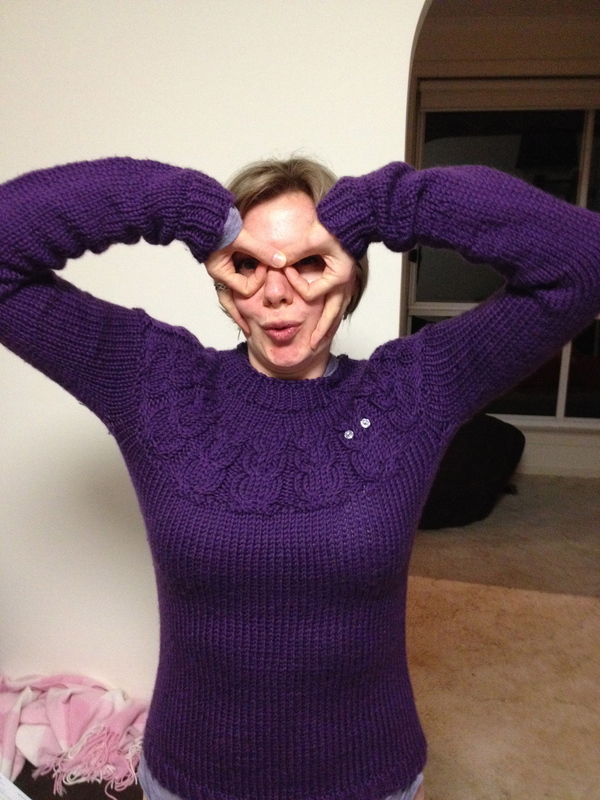 Yes, dear readers, I had a bad case of sweater-itis. I tried to get on board with the Water Music shawl, but my hands weren’t used to the inelastic silk, and I kept accidentally poking my fingertips through the lacework. I mentioned to Emma that I was making slow progress on the train with it and she told me that Water Music really wasn’t suitable public transport knitting. That was all the justification I needed. Yep, that’s me striking my best owl face. This is Kate Davies Owls. You know it’s an amazing and widely popular pattern when you wear it and a non-knitting friend (yes, I sometimes, well actually mostly, associate with non knitters – they won’t understand my stash but at least they won’t steal from it either.) instantly recognizes it and adores it. Turns out her mum made one for her ages ago. Anyway, this jumper was knitted up really quickly, within a month or so. 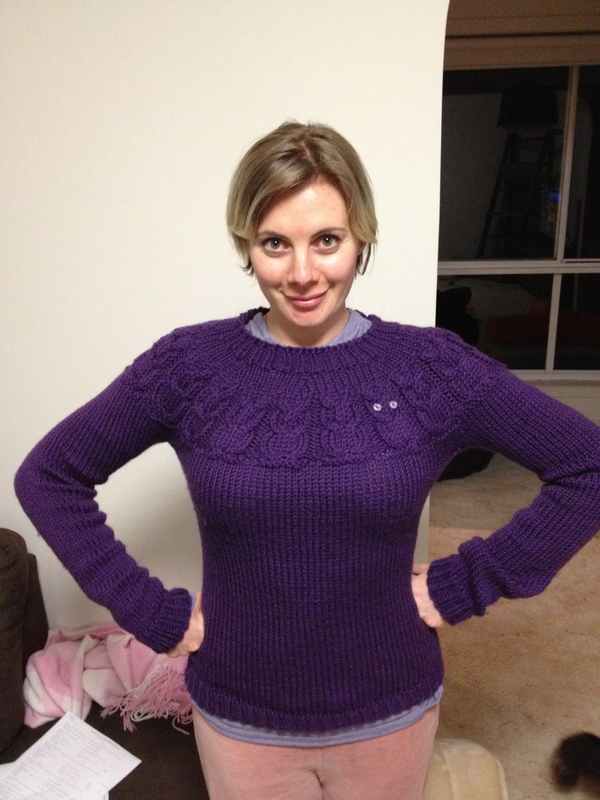 I ended up going up a few sizes larger than what my measurements would normally dictate because my gauge was a bit low and I was worried that changing to larger needles would result in a lack of much needed stitch definition for the owl yoke. Knitting from the bottom up in the round was a first for me and I must admit I thought it was stupid at the time to do the sleeves then join everything all together for the yoke as it meant I had a lot of jumper flopping around in my lap there on in. But I must admit, this jumper fits the best out of all my handknit jumpers and cardigans through the shoulder area, so perhaps there’s something to it, or my skills are improving in general. The sleeves are a little on the long side after blocking and as you can see I chose to only add “eye” buttons to one owl instead of all of them, I think adding to all would be a little overwhelming with my style. Contrary to what may be in evidence on this blog I do not always wear tracksuit pants, and I never leave the house in them. Any more. Ok, moving right along. As Emma has already pointed out, yes it is September and with that one would think that a certain other project that should have been completed by the end of August would be done by now, but alas, it’s still on the needles. It’s almost done, I swear it, but I was coming up to the bind off and I had heaps of yarn left so I decided to keep going with the lace border. In case you don’t believe me here’s where the shawl is currently at and how much yarn I have still, that’s a regular sized bottle of nail polish too. As you can see I still have heaps of yarn left, so I’m just going to keep on adding rows. I’m slightly worried that the yarn will never run out and I will have a shawl that will just keep on growing and growing and I’ll be buried with it still on the needles in my hands. Should a freak train accident happen in the next few days and I do actually die with this project in my hands, is it too much to ask for someone to cast off, wash the blood and debris out then block the shawl to it’s rightful glory? I’m giving myself until the end of the month to finish this then it will be all systems go for the Victory hat. Never have I wanted the end of a ball of yarn to come more swiftly, but not so swiftly that I don’t have enough left to cast off. Wish me luck. This entry was tagged gabriela, knitting and death, knitting mojo, owls, Sambuca, sweater-itis, Water Music. Bookmark the permalink.